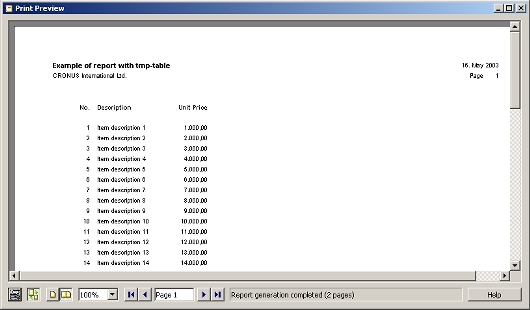 When you normally create a report, it is based on one or more tables. Sometimes you need to create a temporary table (eg. to combine or sort data) and you want that data to appear in a report. 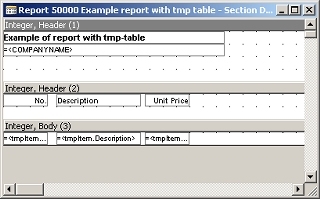 The problem is that you can't use a temporary table directly in the DataItem-property of the report. It only accepts "real" tables. The solution for this is to use the virtual table Integer instead, and write code to simulate the OnAfterGetRecord-trigger. 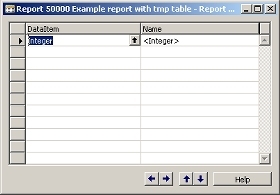 When defining the layout of your report, you use this Integer-dataitem to place your headers and body's. You can't use the Field Menu to place fields on your report: you have to type the name of your tmp-variable together with the fieldname (eg. tmpItem.Description).